Performers include: Jonah Hill, French Stewart, Nat Faxon, Joy Osmanski, Leslie Mann, Renee Taylor, Jake Johnson, Cristina Pucelli, and Will Forte. When pretentious seven-year-old Allen Gregory De Longpre (Jonah Hill) looks in the mirror, he doesn’t see a child. He sees a young man who is intelligent, sophisticated, worldly, artistic and romantic — all characteristics that he inherited from his wealthy and petulant dad, Richard (French Stewart). Father and son share an extraordinary bond that is sometimes (annoyingly) interrupted by Richard’s hunky life partner, Jeremy (Nat Faxon). Allen Gregory has little respect, if any, for Jeremy. They all live together in a stunning architectural loft, along with Julie (Joy Osmanski), Allen Gregory’s neglected adopted sister from Cambodia. Although Allen Gregory has allegedly composed operas, written novels and even dated Chloe Sevigny, he must embark on his greatest challenge yet. Jeremy must go back to work so he can’t homeschool Allen Gregory any longer. 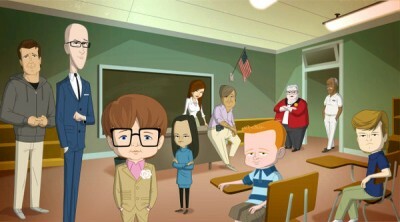 As a result, the tyke must start attending a public elementary school for the first time. His journey is filled with struggles as he doesn’t fit in very well with the other kids at school — or the faculty for that matter. He has an all-out rivalry with Gina Winthrop (Leslie Mann), his by-the-book second grade teacher, and a unique attraction to his 68-year-old principal, Judith Gottlieb (Renee Taylor). As to classmates, Allen Gregory desperately wants to be best friends with Joel Zadak (Jake Johnson), the school’s popular stud. Thankfully, he has the help of his trusty friend and assistant, Patrick Vanderweel (Cristina Pucelli), and the support of Superintendent Stewart Rossmyre (Will Forte), who believes the De Longpres are a tremendous asset to the school. Allen Gregory bribes Principal Gottlieb into a romantic situation that he hopes will bring them closer together. Selfish Richard uses his adopted daughter Julie to compete with his frenemy’s adopted child. First aired: December 18, 2011. Allen Gregory: Has FOX Cancelled the Animated Series? I absolutely loved this show, was surprised when I didn’t see more episodes. Pretty disappointed. Show was terrible. Could never finish watching this show. People need to give this show more of a chance.